At first it’s shock, and then suddenly panic emerges. Your nail has just broken. While it might feel like the end of the world at first, there is hope. Sure, things aren’t going to go back to normal in an instant, but with a few simple remedies a broken nail doesn’t need to be the disaster that it initially appeared to be. We will now take a look at three remedies to fix the broken nail, and eliminate all of the heartache that goes with it. This first method is one of the quickest we will look at, although on the flip side it is temporary so you may have to make longer-term arrangements. Firstly, take a piece of tape and cut it down to the size that is comparable to the tear on your nail. 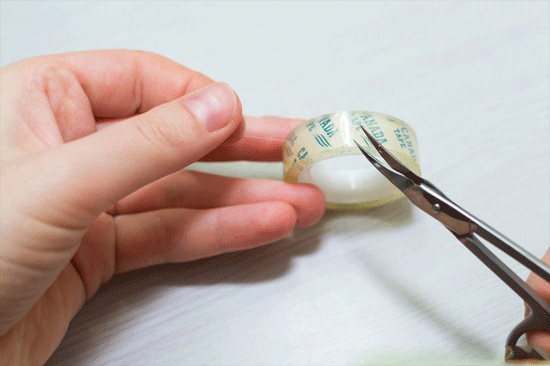 We would advise using sewing scissors or nail scissors at this point, for the simple reason that the tape won’t tend to stick to the scissor blades so is immediately easier. You should also make arrangements in relation to the tape; opting for one of the single-sided variety that only contains a mild adhesive. In other words, avoid the likes of electrical tapes and opt for something like gift wrap tape. With your new piece of tape, proceed to cover the entire tear on your nail. You should make sure that the tape goes right over the center of the break, pressing down as firmly as you can to ensure that it sticks accordingly. To make sure that it’s properly in place, opt to rub the tape in the direction of the tear as opposed against it. If you try the latter, there’s every chance it can worsen the tear. Once your tape is in place, you should next tidy it up. For some of you, this job will be a breeze, but on a lot of occasions you will have tape sticking out of the sides which you will need to trim away. At this point we should add that even though this is a form of fixing your nail, it is temporary. It means that you should look into more permanent methods as a matter of urgency. When the time does come to remove the tape, make sure you carry it out really carefully as well. In exactly the same way you did when you applied the tape, make sure you remove it in the same direction of the tear rather than against it. 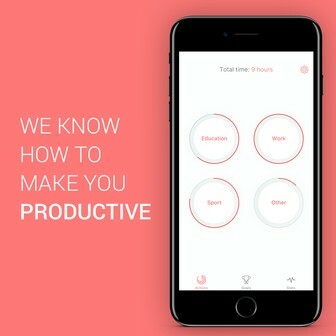 The first method we looked at was quite simple in nature, and is ideal for those of you who are either short on time or who just want a short-term fix. For anything else, it’s time to read on. The premise of this next method is to take advantage of nail mending material. If you don’t have any of this accessible, some people will turn to a tea bag instead to get the desired result. You will need to start by washing your hands and feet, to make sure that they are free of oils. Make sure you dry well and also carefully, with the latter especially important in a bid to avoid worsening the broken nail. Take a piece of your nail mending material, making sure that it is big enough to cover the nail and also wrap the material under the tip. If you have sufficient amounts at your disposal, it’s usually best to collect a piece which is large enough to cover the whole nail to make sure that everything is in place. Now that you have your piece ready, it’s time to attach it. 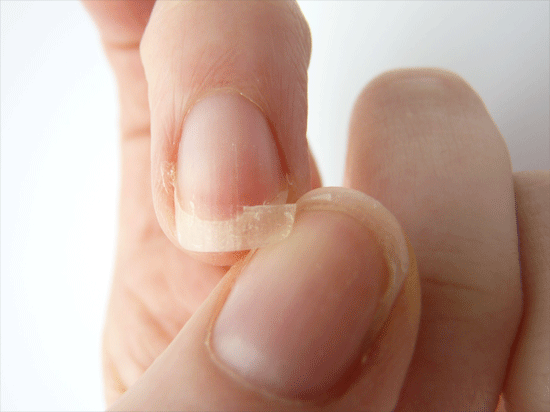 Take some super glue, or nail glue if you have any, and apply to your nail. Make sure the glue covers your entire nail, before taking the piece of material with a pair of tweezers and placing it on top of the glue. You can also use the tweezers to eliminate any bumps or wrinkles which may have become prevalent in the material. The next stage is a little more intricate and involves placing the material over the top of the nail, so it eventually folds on the underside and into position. This part can take a little time to master and you may need to apply more glue in a bid to secure the material accordingly. With the material in place, it’s time to trim and buff your nails. You should turn to a buffing stone at this stage, making sure that you gently polish the nail. It’s advisable to only buff in one direction to guarantee that the nail incurs no further damage. Finally, take some nail strengthener and apply a top coat to your nail. This will add the necessary protection and also provide some balance. Ideally, this should be done the following day, once all of the other adhesives have dried. In the situations where your nail has become completely detached, a slightly different course of action is required. First and foremost, you will need to treat your finger. This will most probably involve stopping the bleeding, making sure that you use sterile cotton pods to aid the process. Like with all forms of bleeding, make sure you apply sufficient amounts of pressure. Once you have carried out the above, trim down with nail clippers to make sure that no sharp edges exist, before then soaking your hand or foot in a bowl of water to numb the area. This process should last for twenty minutes, while for added protection you should follow up by soaking it in salt water for the next twenty minutes. By opting for salt, you will immediately reduce the risks of suffering an infection. 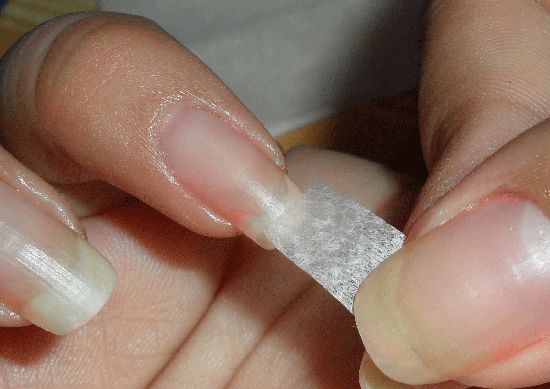 Some people will also apply an antibiotic on top of the nail to make the process even quicker. 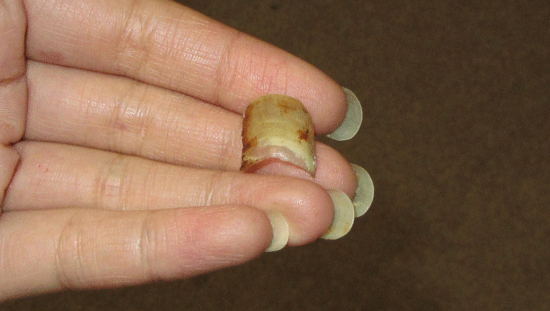 Finally, make sure you cover the nail with a bandage while the new nail starts to grow. This bandage will remain in place for a decent period of time, but needs to be changed every time you clean or soak the wound. This cleaning process will allow you to monitor the injury as well; making sure that no infections have occurred. Usually, an infection will occur within the first 72 hours, while after that the chances of it happening start to drop.